The Ocean Springs Hotel was located on what has become known as the Hotel Tract. The south boundary of the property fronts three-hundred feet on the Bay of Biloxi which consisted primarily of marsh until more recent times. The west line of the Hotel Tract is twelve-hundred feet in length and is bounded by the "Many Oaks" estate founded by New Orleanian, John B. Honor (1856-1929), in 1909. The north line is Cleveland Avenue, once called Calhoun, a distance of three-hundred seventy feet. The eastern periphery is formed by Jackson Avenue-one thousand three-hundred seventy feet to the Bay of Biloxi. Today, the Hotel Tract comprises about eight acres of residential neighborhood. The approximate site of the Ocean Springs Hotel was twelve hundred feet north of the Bay of Biloxi. The hotel was about twelve feet above mean sea level. Bargas estimates the west wing additions (only one is visible in the photographs) to be seventy feet in length. It is not known if the second wing was ever built. It is judged this unit may have had twenty-eight rooms while the main building contained thirty-four rooms. Assigning two people per room, the hotel would have had a one hundred twenty-four person capacity. This figure is corroborated somewhat by an article in The Biloxi Daily Herald (1905) which stated that "the hotel had accommodations for one hundred and fifty guests". All buildings were of wood frame construction. It is assumed that the hotel had outbuildings typical of this era such as, stables, a large kitchen, and outhouses (latrines). Early in the morning of May 25, 1905, a raging fire was discovered on Jackson Avenue in Ocean Springs destroying what had once been one of the finest of the flagship hotels of the Mississippi Gulf Coast's resort spas. Such spas, called "watering places" were renown for their medicinal, spring fed waters. These "watering places" referred to by newspaper reporters from New Orleans as the "Six Sisters" were Shieldsboro (Bay St. Louis), Pass Christian, Mississippi City, Biloxi, Ocean Springs, and the Pascagoulas (East and West). When the fire department arrived, the great Ocean Springs Hotel was too far gone to be saved by the valiant firemen. The majestic old hostelry and most of its contents were consumed in the conflagration. The history of the Ocean Springs Hotel commences with the discovery of the mineral springs on the south bank of Old Fort Bayou by the Reverend P.P. Bowen (1799-1871), the minister of the Tidewater Baptist Church, in 1852-1853. As the result of this find, the tourist industry was born at East Biloxi or Lynchburg Springs (name changed to Ocean Springs in 1854). George Lynch (1835), a native of Maryland, who operated a sawmill with Bowen near the present day Fort Bayou bridge had given his name to the town in 1853. The Reverend Bowen constructed marble baths at the Iberville Street site, and visitors began to arrive for treatments in the medicinal waters known to the local Indians as "E Ca Na Cha Ha" (Holy Spring). The population in the area was quite small at the time and consisted of descendants of the French Colonial occupation, immigrants from France, Spain, Germany, and Ireland, and Anglo-Saxon families migrating from the Carolinas and Georgia. For the most part, the people in the Ocean Springs area subsisted by fishing, lumbering, charcoal making, farming, and brick making. As the mineral springs grew in popularity because of their propinquity to the larger population centers at New Orleans and Mobile, it was natural that someone would build an edifice to accommodate the additional flow of visitors. Although Reverend Bowen did build a boarding house near his Marble Springs, it wasn't until a New Orleans physician, Dr. William G. Austin, constructed a large, first class hotel on the front beach west of Jackson Avenue that sufficient space and amenities were available to the sophisticated traveler. Dr. William Glover Austin (1814-1894) was born in Somerset County, Maryland in 1814. He did undergraduate work at Kenyon College in Ohio, and received his medical degree from the Washington University of Baltimore in 1836. He left medical school and went to Yazoo County, Mississippi where he practiced medicine and married Martha E. Porter (1818-1898), a fine lady from a notable Giles County, Tennessee family. The Austins moved to New Orleans from Yazoo County about 1840. Here Dr. Austin practiced medicine for over forty years and was regarded highly as an authority in epidemic diseases, especially yellow fever. The Austins had at least six children: John Edward Austin (1840-1878), Martha Porter (1842-1910+), Louisa Porter (b. 1846), William M. Porter (b. 1849), Willie (Willamena?) Porter (b. 1854), and Thomas Porter (1855-1855). The children were all born in Mississippi except for daughter, Willie, who was a Louisiana native. William L. Porter, probably the brother of Martha Porter Austin, owned a mercantile store at Ocean Springs in the 1850s and may have been a factor in their locating here. Porter Avenue in Old Ocean Springs is named for this pioneer family from south central Tennessee, probably Giles County. When New Orleans fell to Union forces in 1862, Dr. Austin was superintendent of the Charity Hospital. He went to the front lines and saw active service. In the post-War years, Austin was appointed to the Board of Health by Governor Nicholls, and in 1889 Nicholls appointed him resident physician at the Mississippi Quarantine Station. In addition to the mineral springs, the Ocean Springs area offered the seasonal tourist excellent fishing and oystering, sailing, salt water bathing, constant cooling sea breezes, and some relief from the dreaded "yellow jack" which was pervasive at times during the summers at New Orleans and Mobile. The Morgan Line packet made daily trips to the area from New Orleans in only eight hours during the tourist season. A letter dated Ocean Springs March 30, 1855 by Elvira A. Cox (b. 1809), the sister of George A. Cox (1811-1887), an Ocean Springs pioneer, to her father at Jefferson County, Alabama gives an impression of the area at this time: This is a very healthy place. Ocean Springs, our little town, is situated immediately on the Bay of Biloxi. We live about a half mile from the hotel right on the bay at a beautiful place. It is called Magnolia Grove. If it was not for the cold weather we would not think of it as winter as we are surrounded with magnolias, live and water oaks, and cedar trees in abundance and flowers of every description, and upon the whole it is a beautiful place. There are abundance of fish and oysters here and crabs and all such things but it is a new settled place. Their were but a very few houses here two years ago. Their were but very few that had gardens last summer. Vegetables were scare indeed.....The land back of this place is so poor it is not cultivated in the summer season. Their is a boat that makes five trips from here to New Orleans a week and it is about fifty miles by land to Mobile. I am very pleased with the people here. Their (sic) a great many families that came over from the City and stay through the sickly season. Their are mineral springs all about over the place and we have a time bathing in the salt water. (from The Neaves Story). Dr. Austin named the hotel the Ocean Springs Hotel for the valuable mineral springs located near the ocean (Bay of Biloxi). Although 1835 is the date generally given for the founding of the Ocean Springs Hotel, the year, 1853, is more appropriate. 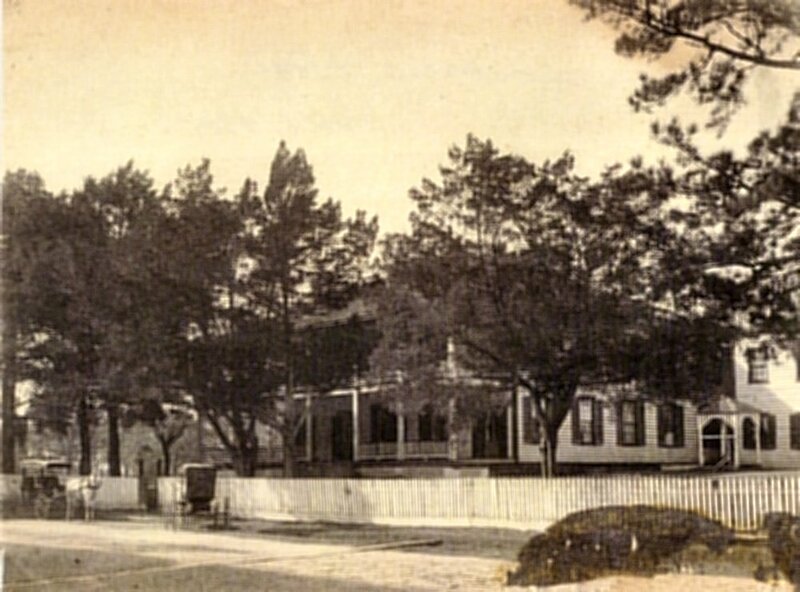 Charles Dyer in Along The Gulf (1895) wrote: With the exception of the old Gulfview at Mississippi City, the Ocean Springs Hotel is without doubt the oldest established hostelry on the Gulf. It was originally built in 1835 by a Mrs. Porter, the mother of the wife of Dr. George W. Austin, the celebrated New Orleans physician who gained a name for himself during the terrible yellow fever epidemics of some years ago. It is postulated that the date 1835 proposed by Dyer was a transpositional error in his manuscript and should have read 1853, the correct date for the hotel inception. In 1835, the land upon which the Ocean Springs Hotel was constructed was in the possession of the LaFontaine Family being part of the 237 acre private Claim of the Widow LaFontaine, Catherine Bourgeois (1768-circa 1845), which was confirmed by an Act of Congress in March 1819. On August 31, 1846, the Widow LaFontaine tract, known as Claim Section 37, was divided among her heirs and legal representatives. The tract, called Lot 2, upon which the hotel was built was deeded to Pennsylvanian, Robert B. Kendall. It had a front of 672 feet on the Bay of Biloxi and went approximately 2500 feet to the north. Curiously in July 1986, The Ocean Springs Record reported that the tombstone of Deborah Porter had ended up at Pointe-aux-Chenes in Gulf Park Estates. Charles Ernest Schmidt (1904-1988), local historian, civil engineer, and former Mayor, returned it to Ocean Springs. He placed the stone in his front yard at the northwest corner of Jackson and Cleveland Avenues where it rest today in a horizontal position. This is very close to its original location in the small cemetery behind the former Ocean Springs Hotel site on Cleveland Avenue. Schmidt describes the hotel cemetery as surrounded by a heavy ornate iron fence and containing four grave sites. In August 1855, The New Orleans Christian Advocate reported that Thomas Porter Austin, the infant son of Martha E. Austin, died of pneumonia at Ocean Springs. This child was probably buried on the Hotel property. It is generally believed that the four graves were exhumed during the 1930s by a WPA work party and interred at the Evergreen Cemetery. It cannot be determined with a great degree of certitude who actually built the Ocean Springs Hotel. Dr. W.G. Austin, the New Orleans physician who earned an excellent reputation for dealing with yellow fever, and Mrs. Henrietta Porter, his mother-in-law, are generally accepted as the initiators of the project. It is believed that Dr. Austin operated a health sanitarium at Indian Springs near Fort Bayou and had the hotel built to accommodate his clients. Because the land records of Jackson County have been destroyed several times by fire before 1876, it is not always possible to abstract older properties without breaks in the title chain. In the matter of the Ocean Springs Hotel, this appears to be the case. Utilizing newspaper reports from the New Orleans Daily Delta, New Orleans Daily Crescent, New Orleans Daily Picayune, and other journals of the time, it is possible in conjunction with deed records to trace the history of this property with some degree of certitude. From the ownership of Warrick Martin in 1854, until the cessation of the Civil War in 1865, there is some question of hotel proprietorship. It appears the owner/owners may have leased the property to a number of proprietors through these years. Among them were: Enoch Everitt (b. 1853), L. Jennings (b. 1854), John McDonnell (b. 1856), F.A. Kent (b. 1857) who proposed opening a male and female seminary, J. Wilkinson (b. 1859), Judge T.C. Scarborough (b. 1866), Mr. Arrington (b. 1867), Colonel A.G. Burley (b. 1869), J.P. Longly (b. 1873) and Colonel Strout who died in August 1878, at the hotel of yellow fever after throwing up black vomit. Ohio native, Harvey Cree (b. 1837) was at the hotel in 1880. These managers were represented at New Orleans by booking agents such as: The E.W. Geer & Co. in 1859 and General Charles A. Labuzan in 1866. It is known that the during the 1855 September Storm, that Captain Walker’s wharf, which was situated at the foot of Jackson Avenue was severely damaged. The New Orleans Daily Picayune of September 18, 1855, reported that,"Captain Walker was on the pier head of his wharf when the latter was swept away, and there he had to remain all night, and until 4 P.M. on Sunday when he was discovered with a flag of distress flying". This Hotel is now being thoroughly Renovated and Newly furnished and will be Opened for the Reception of Visitors on the FIRST DAY OF NEXT JUNE. Every effort will be made to render Visitors comfortable, and to make their stay pleasant. Than the beautiful bay at Ocean Springs, there is no better place for yachting, fishing or bathing. The Mineral Springs so celebrated for their curative powers are in excellent condition. An Omnibus will run regularly several times a day to and from the Hotel to the Springs. For testimony respecting the medicinal virtues of these Springs, reference may be made to Dr. Austin or Dr. Thorpe, New Orleans, to Rev. Dr. McTyere, Nashville, Tennessee. Ocean Springs never having been visited by epidemics is decidely the healthiest as well as the most beautiful location on the Gulf shores. During the Civil War (1861-1865), the Ocean Springs Hotel was probably closed to guests because of the conflict. Ray M. Thompson in his The Daily Herald column, "Know Your State", of June 8, 1961, relates an anecdotal story in which a Confederate conscript officer was invited by an unwilling candidate to the Ocean Springs Hotel for a drink. Before they were to join the Rebel army, the young man got the officer so completely inebriated that he was able to slip away. Some bars never close! William B. Schmidt (1823-1901) and Frances M. Ziegler (1818-1901) were wholesale grocers and liquor importers from New Orleans. Schmidt was born at Schwieberdingen, Baden-Wurttemberg, Germany on April 10, 1823. His parents settled initially at St. Louis, Missouri and Lexington, Kentucky before establishing permanent residence at New Orleans in 1838. In 1845, at the age of twenty-two, Schmidt commenced a business relationship with Francis M. Ziegler, a native of Oberndorf-Am-Nekar, Baden-Wurttemberg in southwestern Germany. Their firm, Schmidt & Ziegler, began as a small wholesale grocery business on Old Levee Street in the Vieux Carre. It later located at 428-436 on South Peters. By 1900, Schmidt & Ziegler had expanded to eleven stores. The firm was the pioneer in New Orleans international trade initiating commerce between South and Central America. In January 1849, W.B. Schmidt married Virginia A. Jackson (1835-1912) who was born at Philadelphia of Cuban parentage. Ziegler married, Adrianna Weissenburger (1831-1886) on the same day at the Third Presbyterian Church in New Orleans. She was a native of Lauterburg, Lower Alsace. In later life, it is believed Schmidt converted to Roman Catholicism. He donated land on the northwest corner of Rayborn and Porter to the St. Johns Episcopal Church in 1891. W.B. Schmidt called his property "Summer Hill". By 1895, the Schmidt holdings were of estate proportions. Charles Dyer in Along The Gulf (1895) (Ocean Springs Section) describes the Schmidt property as follows: The finest, most elaborate and most expensive estate on the entire gulf coast is that of Mr. W.B. Schmidt, of New Orleans. Covering as it does an immense territory of hilly land, with beautiful ponds, of which there are three large islands, namely Dog, Crane and deer Islands each of which have an immense iron figure according to these names. These beautiful spots are connected with one another and the main island with rustic bridges. The house, which is an elaborate modern structure, sits on a high bluff, surrounded by a beautifully mowed lawn, with numerous beds of rare flowers and majestic oaks, magnolias, and cedars. The tall stately pines are in abundance in the rear of the estate, through which runs numerous walks and drives. The house itself is one of the most elaborate on the coast. It is large and airy, with wide gallery and immense rooms, and, being located on a hill, near the water's edge, the stiff gulf breeze is generally blown through the house, which is magnificently furnished with everything necessary for the comfort of its owner. Mr. Schmidt has spent nearly $40,000 on improvements alone, so the reader may form an idea of the magnificence of this estate. The Ziegler home, called "Lake View", was located west of the Schmidt Estate on Lots 17, 18, and 19 of Block 17 (Culmseig Map). It was modest in comparison to the Schmidt holdings. Dyer (1895) described it as: an attractive little cottage, situated on a hill, with neatly laid out and well-kept lawn, with any number of massive moss-covered oaks and magnolias to shade it. The estate contains all the comforts it is possible for a complete seaside residence to have. Schmidt was described as a quiet, thoughtful man with a will of iron and a heart of gold. He was a moving force assisting those less fortunate than himself. At various times, he sent German immigrants to Ocean Springs to work on his estate until they could get a start in life. Among those whom Schmidt guided to Ocean Springs were Adolph Joseph Schrieber (1835-1875) and Ferdinand W. Illing (1838-1884) who had escaped from Mexico in 1867 after the fall of Emperor Maximilian and his German and Austrian nationals. Illing operated a hotel, the Illing House, on the northeast corner of Washington and Porter for many years. Among the organizations and enterprises during his life, Schmidt could list: Sugar Exchange, Board of Trade, Board of Liquidation, Charity Hospital Board, Eye, Ear, Nose and Throat Hospital (President), Canal Bank (Director), Teutonia Insurance Company, Texas and Pacific Railroad (Director), and Vice-President of the organization responsible for the Cotton Centennial of 1884-1885 in New Orleans. In his obituary of 1900, he was described as "not only a merchant prince, but a prince of merchants". The month of June 1878, found Schmidt & Zeigler extending their hotel wharf into the bay of Biloxi to accommodate thePearl Rivers, the steamboat, of Captain Junius Poitevent (1837-1919). Poitevent was reared in lower Hancock County and moved to Ocean Springs about 1877. He built a Victorian Italianate home for his family called "Bay Home" at Fort Point. The Pascagoula Democrat-Star stated that "Captain Poitevent does everything in his power to accommodate the coast people which is in marked contrast with the policy pursued by the railroad company." (June 14, 1878, p. 3). Poitevent's steamer left Ocean Springs at 8:00 AM on Monday and Friday. Before her demise, Mrs. Buford also recorded the death of Colonel Strout of the Ocean Springs Hotel. On August 19, 1878, she wrote to her husband at Water Valley: Mr. Strout one of the proprietors of the hotel died last night, and Dr. Dunlop (sic) dispatched the board of health this morning...that he died of black vomit and the place is in ferment. The citizens have protested against his remains being carried through town and he will be buried in the hotel yard. This charming summer resort, one of the most delightful on the lake coast, is now open under the new management for the season of 1880, with first class accommodations for 250 guests. The health and pleasure attractions of the Gulf Coast of Mississippi are unparalleled, and at Ocean Springs alone can visitors enjoy the benefits of the mineral waters. The salt bathing and fishing are unsurpassed. All that visitors can desire is obtainable within three hours ride from New Orleans and two from Mobile by three daily trains (the accommodations and excursion trains being now extended to this point). Terms reasonable. Harvey Cree, proprietor. (page 1). This advertisement indicates the Ocean Springs Hotel was catering to the day tripper and weekend guest from New Orleans. The L&N ran an excursion train on weekends to provide daily service for those who wanted to escape the City for a day or two. One train, the "Coast Flyer", commenced service in June 1896 and made the jaunt from New Orleans in two hours and forty minutes. Mineral waters analyzed by Dr. Joseph Jones, of New Orleans. The healthiest and pleasantest resort of any Southern coast. Finest fishing, hunting, and drives. This commodious hotel has just been refitted with hot waters, new carpets in halls and apartments, and other modern conveniences. Families boarded at reasonable rates. Best of accommodations for tourists, commercial travelers, and prospectors. Some months after the untimely death of her husband in April 1892, Mrs. Frye moved to Pass Christian. She returned to Ocean Springs in 1895 to open Frye's Hotel ( formerly the VanCleave) at Robinson and Washington across from the L&N Depot. The Pascagoula Democrat-Star reported in October 1893 that the Ocean Springs Hotel was closed and still for rent. Dr. Jackson renewed his lease for another year as indicated by this line in The Pascagoula Democrat-Star of October 11, 1895: Dr. A. Jackson has leased that popular hostelry, the Ocean Springs Hotel, which will continue under his excellent management for another year. Dr. Ab Jackson renewed his lease for another year as indicated by this line in The Pascagoula Democrat-Star of October 11, 1895: Dr. A. Jackson has leased that popular hostelry, the Ocean Springs Hotel, which will continue under his excellent management for another year. The waters of the springs analyzed prior to 1854 by Dr. J.L. Smith were described by Dr. E.R. Bragg in 1893 as: a mildild saline-chalybeate, containing also sulphuretted hydrogen. This rather unusual combination renders it effective in the treatment of persistent skin and scrofulous diseases.Twentieth Century Coast Edition of The Daily Herald). Franklin Jefferson Lundy (1863-1912) and Louis A. Lundy (1876-1941) were born at Mobile, Alabama. They came to Ocean Springs with their widowed mother in 1889. F.J. Lundy owned a mercantile store at the southeast corner of Washington Avenue and Government. L.A. Lundy was a pioneer in the ice and shrimp industry at Ocean Springs in the early years of the 20th Century. In 1901, the Lundys leased the Ocean Springs Hotel to Dr. Henry Bradford Powell (1867-1949) of Chicago. Dr. Powell later owned a sanitarium, the old Franco home, on Washington Avenue at Fort Bayou where the Indian Springs were located. Mrs. White had a successful season and was negotiating for another lease in May 1905, when disaster struck the Ocean Springs Hotel. After the smoke had cleared on Jackson Avenue in the early morning of May 25, 1905, what hurricanes (1860, 1888, 1893, and 1901), the Civil War (1861-1865), Reconstruction (1865-1877), yellow fever epidemics, quarantines, and economic depressions had failed to do, i.e. destroy the Ocean Springs Hotel, was accomplished by fire in a few hours. Some tables and a piano were salvaged from the ashes and ruins. The old hostelry was valued at $12,000, but the Lundys only carried $5000 worth of insurance on the structure. Dr. Powell was more fortunate as he had fire protection valued up to $2000 for his furniture. About a year after the conflagration, the Ocean Springs News beseeched some enterprising capitalist to erect a modern hotel at Ocean Springs. The summer of 1906 was particularly busy as all cottages were occupied and the hotels were renting annexes. In fact, some people contemplated pitching tents for their guests. Owner F.J. Lundy must not have been enthused by the newspapers suggestions or potential for the hotel business in the town as he made plans in early 1910 to have the Ocean Springs Hotel land platted into fifty-foot lots and put on the market. For fifty two years, the Ocean Springs Hotel had been the social and cultural focus of the city. Its management had cheerfully provided guests and visitors from throughout the South and Midwest with such diverse physical activities as: tenpins, croquet, billiards, fishing, sailing, and saltwater bathing. Socially and culturally, the hostelry provided: dances, plays, music, regattas, balls, suppers, lounges, and newspapers, The Naiad and The Tattler. For those guests who desired the curative properties advertised of the sulphur and chalybeate (iron salts) spring waters, transportation was provided to the Fort Bayou Marble Springs site by carriage three times daily. The Ocean Springs Hotel was the salient catalyst in the growth and development of Ocean Springs in its early years. Although the site of the former structure is now long covered by cultural developments along Jackson Avenue, its place in the history of Ocean Springs is permanently established. Charles L. Dyer, Along The Gulf, "Ocean Springs", (Dixie Press: Gulfport, Mississippi-1972) Originally published 1895 by the L&N Railroad. Regina Hines Ellison, Ocean Springs, 1892 (2nd Edition), (Lewis Printing Services: Pascagoula, Mississippi-1991), pp. 22, 23, and 93. H. Grady Howell, To Live and Die in Dixie, A History of the Third Mississippi Infantry, CSA, (Chickasaw Bayou Press: Jackson, Mississippi-1991), p. 104. Bettie J. Marsh, The Neaves Story, (Marsh: 1979), p. 5. C.E. Schmidt, Ocean Springs French Beachhead, (Lewis Printing Services: Pascagoula, Mississippi-1972), pp. 20. 72, and 73. Charles Sullivan, The Mississippi Gulf Coast: Portrait of a People, (Windsor Publications: Northridge, California-1985), pp. 41, 62, and 63. Charles Sullivan, Hurricanes of the Mississippi Gulf Coast-1717 to Present, (Gulf Publishing Company-1986), p. 135. E.M. and Ema L. Tipton, Marriages & Obituaries From The New Orleans Christian Advocate (1851-1860),(Tipton Printing & Publishing Company: Bossier City, Louisiana-1980). p. 89. Ocean Springs, Mississippi: A Look At The Beautiful Past of a Beautiful City, "The Winklejohn House", (Ocean Springs Junior High School 8th Grade Enrichment Class-1983). Patricia Ann Fenerty and Patricia White Fernandez, 1880 Census of New Orleans (Volume 1), (Padraigeen Publishing Company: New Orleans-1991), p. 132. The Biloxi Herald, “Ocean Springs”, July 4, 1891. The Biloxi Herald, “Local Happenings”, January 9, 1892. The Biloxi Herald, "Ocean Springs", November 8, 1890. The Biloxi Herald, “Frederick Frye”, April 23, 1892. The Biloxi Daily Herald, "Fire at Ocean Springs", May 25, 1905, p. 5. The Daily Herald, "Laura S. Jackson Obit", January 5, 1922, p.4. The Daily Herald, "Dr. A. Jackson Obit", October 28, 1925, p. 1. The Daily True Delta, "Ocean Springs Hotel", June 22, 1859, p. 3. The Daily Picayune, "Biloxi and Ocean Springs steamers", July 14, 1866, p. 2. The Gulf Coast Times, "Know Your Neighbor-Joe Lewis Schrieber", August 26, 1949. The New Orleans Christian Advocate, “Ocean Springs Hotel”, June 29, 1859. The New Orleans Daily Crescent, “Ocean Springs”, June 2, 1857, p. 1. The New Orleans Daily Crescent, “Ocean Springs Hotel”, July 1, 1859. The New Orleans Daily Crescent, “Ocean Springs Hotel”, May 12, 1866, p. 1. The New Orleans Daily Delta, “Sea Shore Divertissements”, September 21, 1853, p. 2. The New Orleans Daily Delta, “Sea Shore Correspondence”, August 23, 1856, p. 2. The New Orleans Daily Picayune, “Letter From Ocean Springs”, July 29, 1853, p. 1. The New Orleans Daily Picayune, “Letter From Ocean Springs”, p. 1. The New Orleans Daily Picayune, “Ocean Springs Wharf”, September 21, 1855, p. 2. The New Orleans Daily Picayune, “Advertisements”, September 21, 1855, p. 2. The New Orleans Daily Picayune, “Ocean Springs Hotel”, April 28, 1866, p. 2. The New Orleans Daily Picayune, “Ocean Springs Hotel”, May 15, 1885, p. 4. The New Orleans Daily Picayune, “Letter From Ocean Springs”, May 7, 1892. The New Orleans Daily Picayune, "W.G. Austin, M.D. Recently Appointed Quarantine Physician at Mississippi Station", February 24, 1889. The New Orleans Times, “Ocean Springs Hotel”, April 28, 1866, p. 2. The New Orleans Times, “Interesting Letter From the Lake Shore”, May 19, 1866, p. 1, (Auctioneer's Supplement). The New Orleans Times, “Miscellaneous”, August 6, 1867. The New York Herald, March 25, 1862. The Ocean Springs Gazette, March 24, 1855, p. 3. The Ocean Springs News, July 27, 1906. The Ocean Springs News, August 3, 1906. The Ocean Springs News, September 11, 1909, p. 1. The Ocean Springs News, January 22, 1910, p. 2. The Ocean Springs Record, "Tombstone Back Where It Belongs", July 24, 1986, p. 1. The Pascagoula Democrat-Star, June 14, 1878, p. 3. The Pascagoula Democrat-Star, August 23, 1878, p. 3. The Pascagoula Democrat-Star, September 13, 1878, p. 2. The Pascagoula Democrat-Star, November 12, 1879, p. 3. The Pascagoula Democrat-Star, “Ocean Springs Items”, May 21, 1880. The Pascagoula Democrat-Star, “Local Paragraphs”, June 18, 1880. The Pascagoula Democrat-Star, “Ocean Springs Items”, July 2, 1880. The Pascagoula Democrat-Star, “New Advertisements”, July 23, 1880. The Pascagoula Democrat-Star, “Harvey Cree’s Saloon”, August 27, 1886. The Pascagoula Democrat-Star, October 23, 1891, p. 3. The Pascagoula Democrat-Star, “Local News”, October 20, 1893. The Pascagoula Democrat-Star, “Local News”, October 27, 1893. The Pascagoula Democrat-Star, August 23, 1895. The Pascagoula Democrat-Star, “Ocean Springs Locals”, May 26, 1899. The Pascagoula Democrat-Star, “Ocean Springs Locals”, June 2, 1899. The Pascagoula Democrat-Star, “Ocean Springs Locals”, February 2, 1900. The Pascagoula Democrat-Star, “Ocean Springs Locals”, November 6, 1903. The Pascagoula Democrat-Star, May 5, 1905, p. 3. The Pascagoula Democrat-Star, May 26, 1905, p. 3. The Pascagoula Democrat-Star, June 2, 1905, p. 2. The Progress, “Local News”, January 18, 1904. The Progress, “Local News”, June 4, 1904. Jackson County General Docket, Volume 2, p. 74. 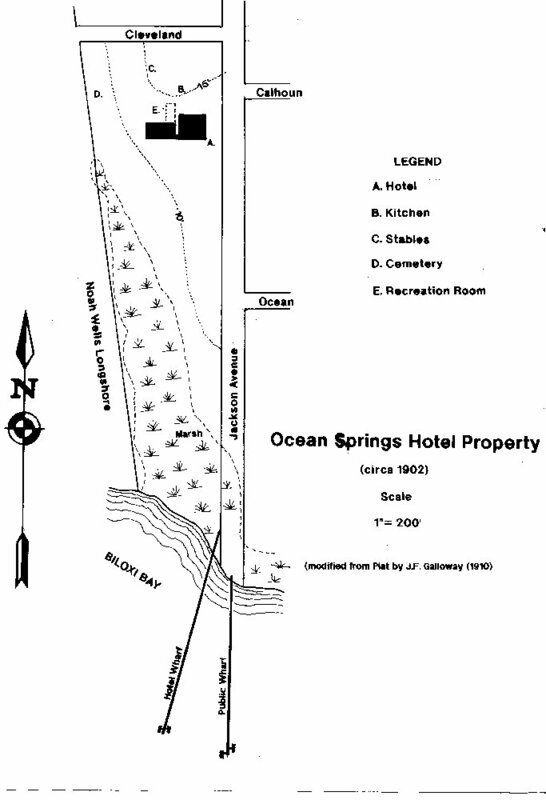 Plat of “Ocean Springs Hotel Property” by J.F. Galloway, Jackson County Chancery Court Plat Book 1, p. 29 (April 1910). US Geological Survey, "Ocean Springs, Mississippi", (1:24000) (1954).